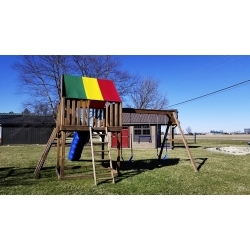 Scroll down to see a sample of the pressure-treated wood playsets and pricing. Our quality pressure-treated wood playsets are made in the heart of Amish country by Amish craftsmen. Our goal is to provide you with an environmentally safe, long-lasting swing set. Strong Steps - Will Hold Adults Too! Questions or need pricing? Just contact us via our website, via phone at (614) 791-8525 or (800) 803-1144 or visit the store with your request. Click Here to view the 2019 Backyard Creations Catalog (PDF file - 77.7 MB). Click Here to view the 2019 Backyard Creations Pricelist (PDF file - 2.38 MB). Please note these are large files. Low-maintenance vinyl playsets are also available - Click here to see our Weaver Vinyl Playsets for more information. Below are two of the five current displays we have on the lot for 2019 - we will be adding the other three models soon. Many other models are available for ordering from the catalog.